Eric Metaxas is the new Johnny Carson! I’ve been trying to have a good attitude about my recent cancer diagnosis. But it can be a drag. “Campin’ Buddies” Nominated for Action On Film Award! The Action On Film Festival just nominated Tom Logan’s “Campin’ Buddies,” starring Ray Stevens, Tom Lester (Green Acres), Don Most (Happy Days) and me as best comedy feature film and best comedy TV pilot. It’s just come out on DVD. Yay! There will be a screening in LA Sept. 23, 2015 at 6:30 pm, at the Krikorian Premier Theater in Monrovia, CA. Super fun movie! Link here. I got to play 6 roles!!! Including these two! “Marriage Retreat” – Brings Hope! 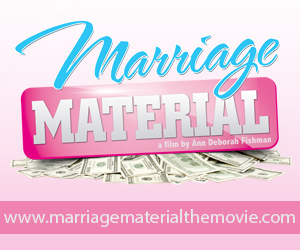 “Marriage Material” the Movie now on I Tunes! Go to MarriageMaterialtheMovie.com to learn more about this fun romantic comedy written and produced by Ann Fishman.